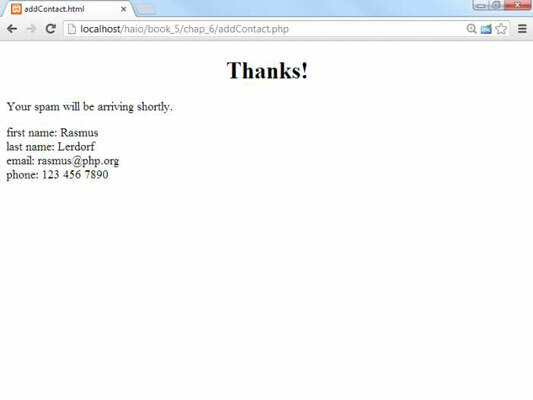 Often, you’ll want to do something in PHP as simple as record information from a form into a text file for HTML5 and CSS3 programming. 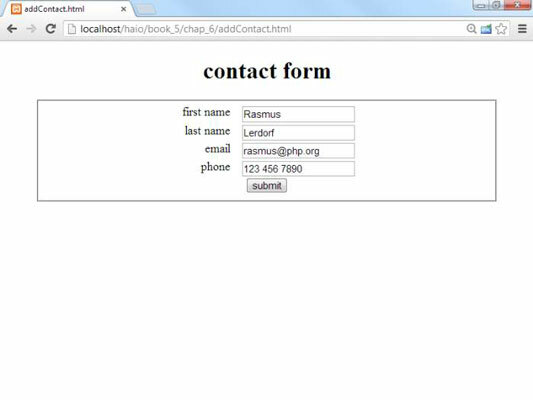 Here is a simple program that responds to a form and passes the input to a text form. The code for this form is basic HTML. When the user enters contact data into this form, it will be passed to a program that reads the data, prints out a response, and stores the information in a text file. Your spam will be arriving shortly. Read data from the incoming form. Just use the filter_input mechanism to read variables from the form. Let users know that something happened. As a minimum, report the contents of the data and tell them that their data has been saved. This is important because the file manipulation will be invisible to the user. Create a variable for output. Open the file in append mode. You might have hundreds of entries. Using append mode ensures that each entry goes at the end of the file, rather than overwriting the previous contents. Write the data to the file. Using the fput() or fwrites() function writes the data to the file. Don’t forget to close the file with the fclose() function. The file extension you use implies a lot about how the data is stored. If you store data in a file with an .txt extension, the user will assume it can be read by a plain text editor. The .dat extension implies some kind of formatted data, and .csv implies comma-separated values. You can use any extension you want, but be aware you will confuse the user if you give a text file an extension like .pdf or .doc.